With the advent of DSLRs for video, and now phone cameras that can shoot up to 4K video, filmmakers have been given a revolutionary tool for low budget movie making. Field recorders, however, haven’t really kept up all that well. One of the major players in the audio accessories for DSLR companies is the Japanese based Tascam. They’ve announced a new product called the Tascam DR-701D which comes with four XLR/TRS inputs with phantom power and dual built-in omnidirectional mics. The big news is that it also has an HDMI input and output which will allow you to automatically trigger recording on the device when your camera records, perfectly syncing both audio and video. The 701D also has SMPTE timecode via a BNC connector and runs on 4 AA batteries. 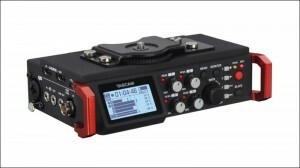 The new Tascam DR701D will for $599 and is available for pre-order here. The unit is expected to start shipping in about two months. Here’s a detailed list of its features.